There's something in the water at my son's school. Another teacher is expecting a baby! I knew she was due in March, but since last time I blinked it was November, somehow time got away from me. When I learned last week that she was leaving on maternity this week, I jumped into gear. I have a list of quilts on my "to do queue" that is a mile long. For some of my quilts, I know the recipient, but it takes months (or, gulp, years for the right design to show itself). On the other hand, I also have pattern I want to try, but am just waiting for the right time or inspiration to hit. 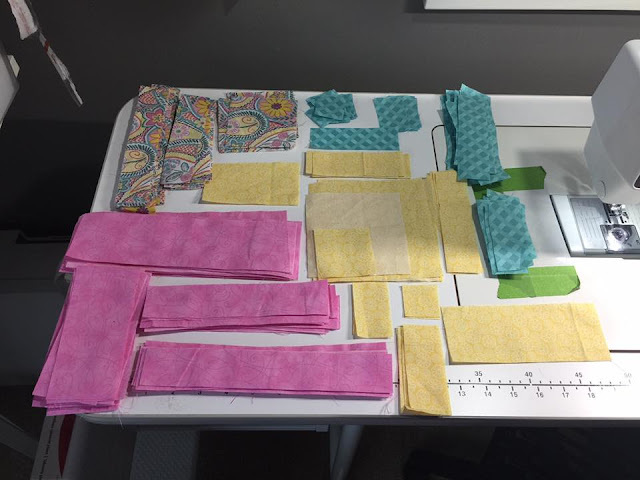 As I start to think about publishing my own quilts and start pattern testing for others, I'm beginning to repeat some patterns I've done in the past. 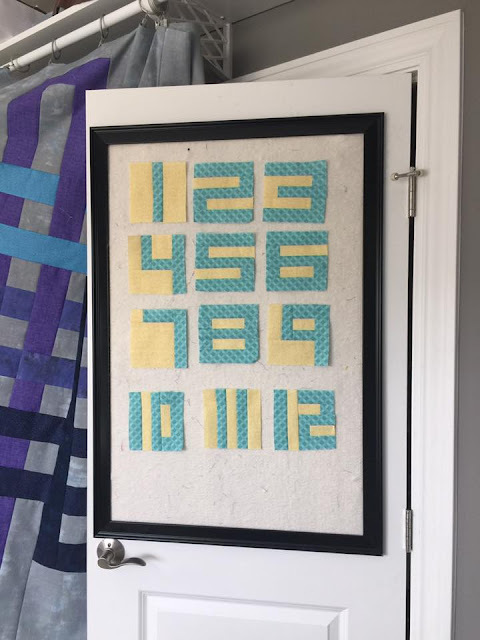 Last month I made my first milestone quilt for another teacher at D's school. 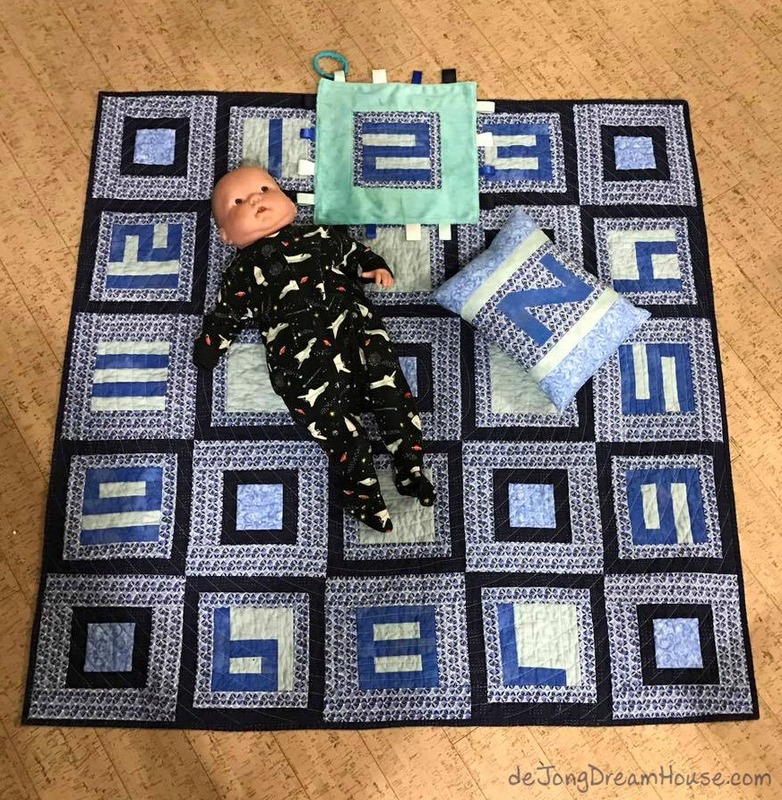 I love the idea and feel a bit bad that I didn't know how to sew when my son was a baby because I wish I would have done something like this. I was really happy with how my first milestone quilt turned out, but wanted to make another with a slightly tweaked design. 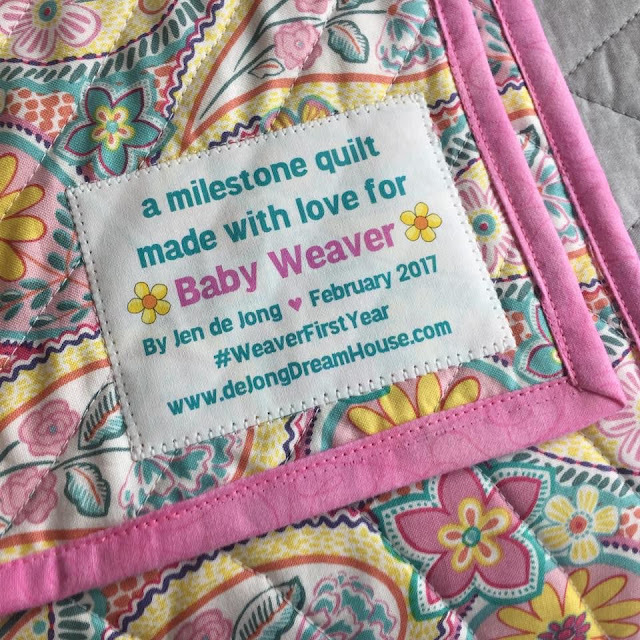 When I knew I had less than a week if I wanted to make a quilt for Mrs. Weaver, it didn't take long to decide to make another milestone quilt. With the first quilt, I made each block one at at time for the most part as I figured out sizes and colors. Because I always take lots of notes (and pictures! ), this time I approached the project as a pattern tester. First I cut out all my pieces. 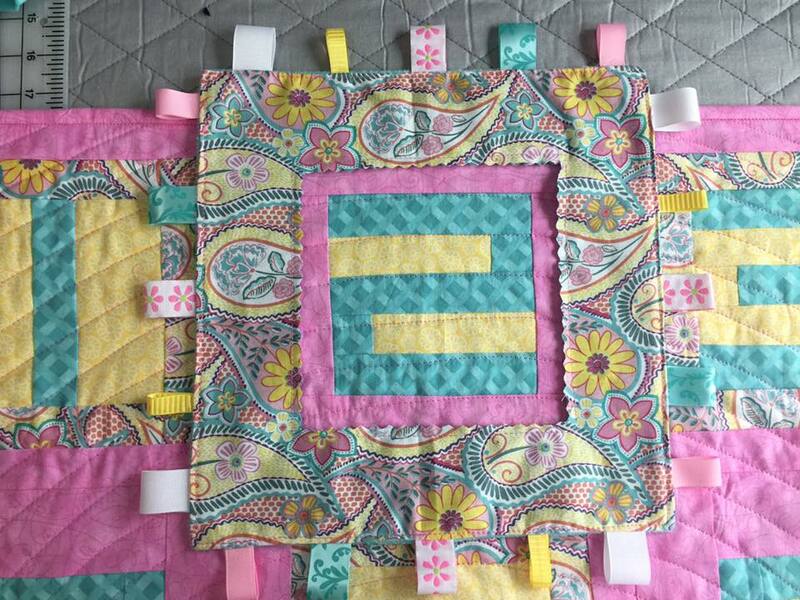 Then I chain pieced the non-number blocks. They went together really quickly. 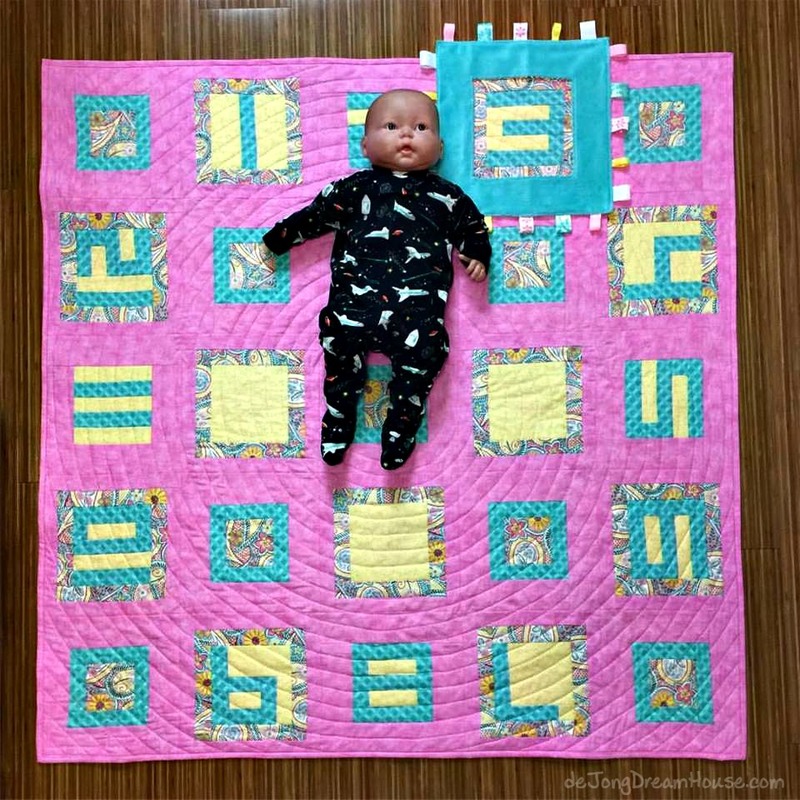 I've never made a log cabin quilt, but the process was similar. This may seem obvious in hindsight, but I realized that by cutting all the pieces to the proper size at the start, I was able to keep my squares more...square. I was very pleased that most of squares were pretty spot on and I did very little trimming. I love the print that has been hanging out in my stash. 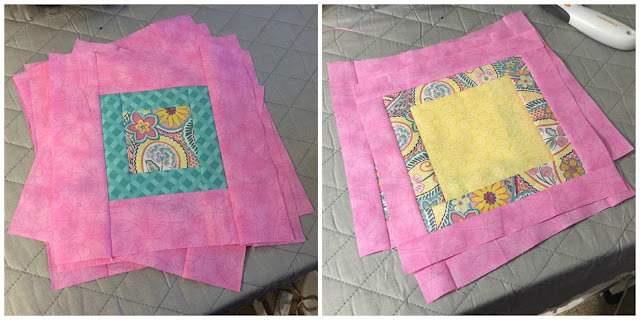 Rather than make it a focus like the first quilt, I opted for a more serene look by highlight it in the small squares and borders, and emphasizing the pink tonal instead. Inspired by my friend Sarah at saroy.net, whose awesome Intertwined quilt I pattern tested. I took lots of pictures of the order I used to make each number. 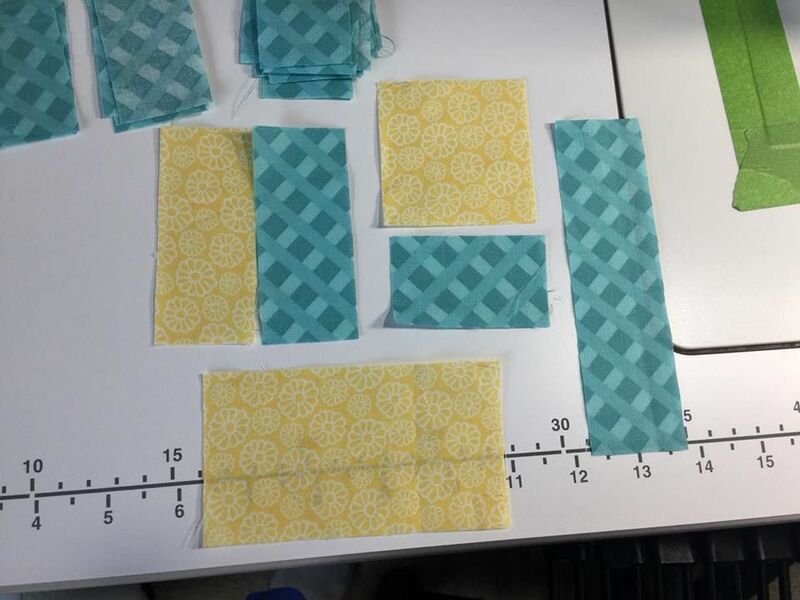 This will help a lot if I decided to write up this pattern for other quilters. I'm usually a one-at-a-time quilter, but at this point I have quilts everywhere. I have my En Provence sandwiched and ready to quilt, you see the top to Intertwined hanging outside my closet, and I have another quilt blocked and ready to piece on my design wall. I look forward to a lot of finished in the next week or two. 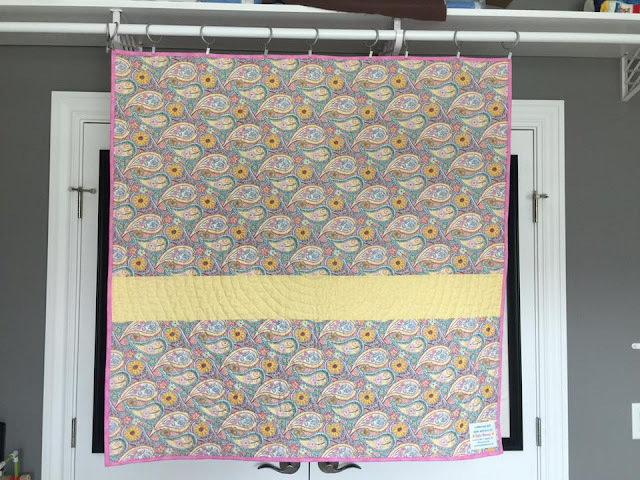 I pulled the fabric for this quilt from my stash. 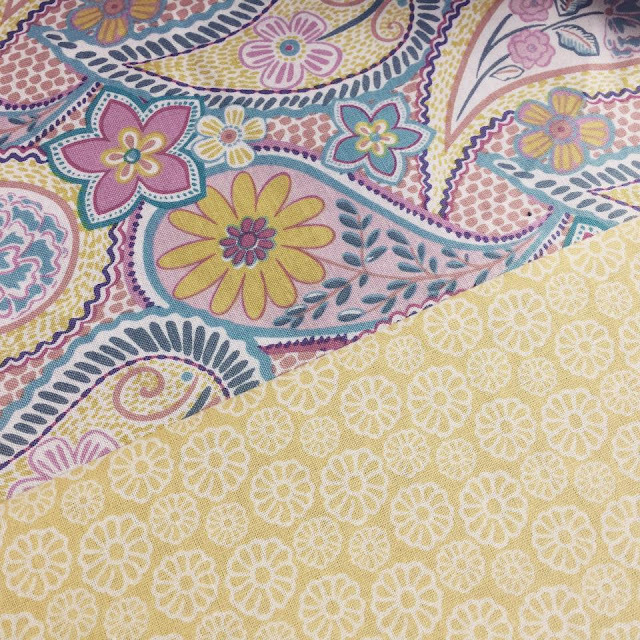 I was really happy when I realized that the yellow I pulled for the color, was a nice match in design as well. I was especially happy that I had just enough to make the back large enough! 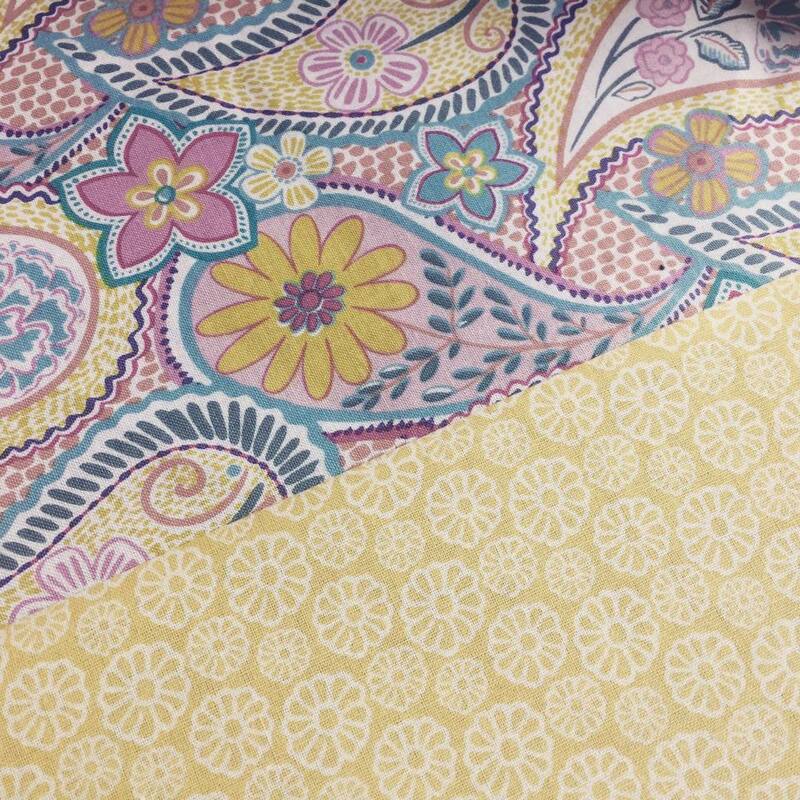 I am in a spiral phase of quilting. I like how the round stitching balances the square blocks. I'm feeling pretty good about how even my stitches turn out. 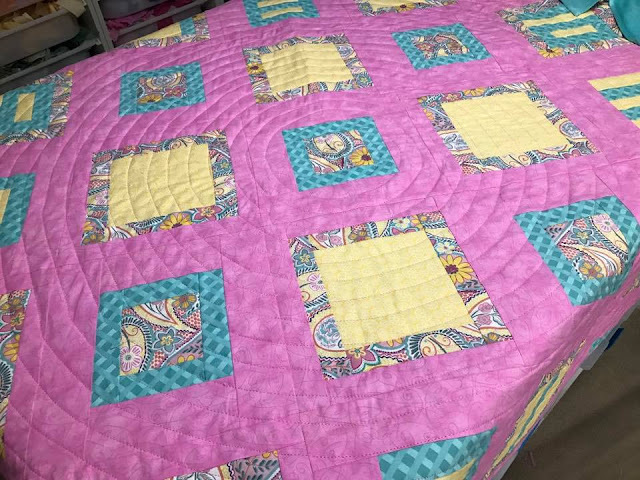 Glad to know that after 75 quilts my quilting is getting better!! D hasn't had Mrs. Weaver as a teacher, but his school is very small (about 120 students K-4). All the teachers know all the students, and vice versa. My heart melted the first time I saw Mrs. Weaver greet my son by name and I realized that not only did she recognize his face and know his name, but she also knew enough about him to know his interests, too. Our school is pretty special so I can't help but look for opportunities to let the staff know how much I appreciate them. 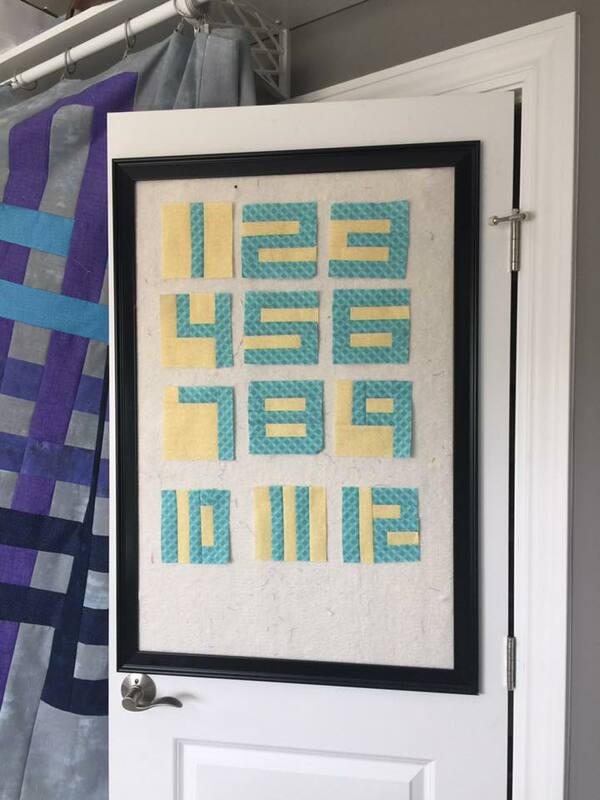 Because it's a milestone quilt, I also made a taggie that doubles as a frame for each month when the milestone photo is taken. She can use either the print side or the minky side. I forgot to get a picture of D with the quilt. He puts the extra love in it. But he will be giving it to Mrs. Weaver today, so hopefully I"ll get a picture of them together. To see more pictures of this quilt in progress, look for #weaverfirstyear on Instagram. If you'd like to see what I'm currently working on, follow me at de Jong Dream House. What a great idea for a teacher's baby quilt. I'm so glad you linked this at Wednesday Wait Loss this week. Did you make a pattern of that? I like your frame addition to get the milestone pictures. Not sure I've even heard of a Milestone quilt, but i love the idea! I too wish I'd known about them when my daughter was little. So cute! Thanks for linking to Wednesday Wait Loss.